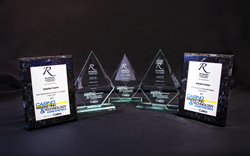 For the second consecutive year Soboba Casino has been recognized with not one, not two, but five Romero Awards for excellence in casino marketing. At the 2017 Marketing and Technology Conference in Las Vegas Nevada, casino officials from all over the world gathered in recognition of great accomplishments made the year prior. Though 2017 marked only the second year that Soboba Casino has been nominated for a Romero Award, it did not stop them from taking the competition by storm both years. With hundreds of submissions, the judges had an abundance of promotions to take into consideration. The judging criteria included marketing strategy, promotion concepts, strategic procedure and execution, creativity, casino revenue, and several other forms of measurable results. For the awards category “Floor Promotions” Soboba Casino was awarded a Golden Romero Award for their “Take on Trejo” promotion and grand finale, which invited guests to a meet and greet with action movie star Danny Trejo. Soboba was then awarded a second Golden Romero Award in the category “Floor Promotions,” for their “Yo Amo Loteria” promotion, which was a play on the classic nostalgia of the Latin board game Loteria. To continue their winning streak, Soboba was then awarded a Silver Romero award in the category of “VIP Promotions” for their “Lightning Link Launch” event in which guests were invited to the grand opening of their brand new Lightning Lounge, given 5 free spins on the new slot machines, and a chance to take a hair raising picture with the static electricity ball. Two honorable mention awards were also given to Soboba for their “Scratch and Sniff Pumpkin Pie” direct mail piece and their “Dynasty Baccarat Grand Opening” promotion. Soboba Casino features approximately 2,000 of the newest, and hottest slot machines, an expansive and modern non-smoking room, 20 classic gaming tables featuring all your favorite card games, and a large outdoor event arena which easily accommodates over 10,000 people. Need to recharge & refresh? Visit the cozy Soboba Cafe and Coffee Kiicha, or experience AC's Lounge with full cocktail bar and three giant HD flat screens including the “Sobobatron,” the Inland Empire’s biggest HD video wall.